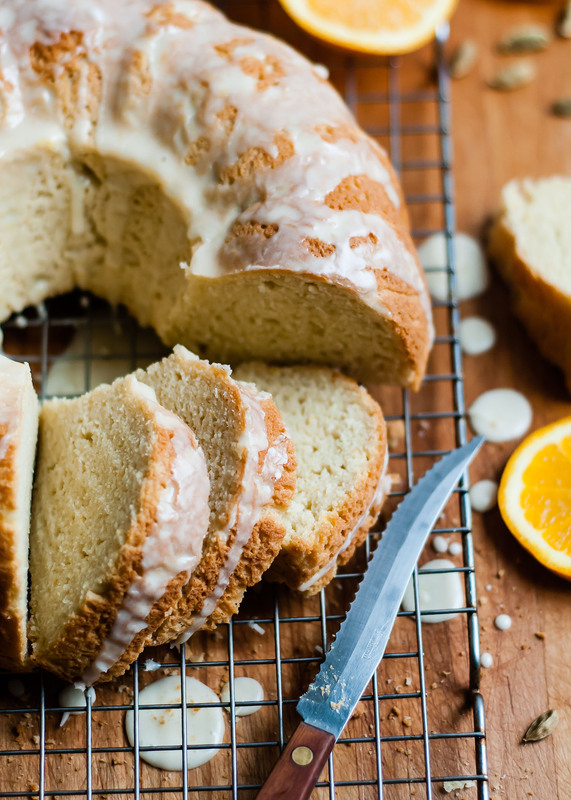 A dense, moist gluten free cake made with yeast and flavored with orange and cardamom. Place 2 cups of the gluten-free flour blend in the bowl of a large stand mixer. Add the xanthan gum and cardamom. Turn mixer on low to combine. Set remaining flour aside. Place warm water, yeast, and ¼ teaspoon sugar together in a small bowl. Stir until yeast is dissolved. Set aside for 5-10 minutes, or until yeast is foamy. In a small saucepan, heat the milk, butter, ¼ cup sugar, and salt. Stir until sugar is dissolved and do not let it boil. It should just be pretty hot. In a medium bowl, whisk eggs together with vanilla and orange zest. Carefully add the milk mixture in a slow, steady stream to the eggs and whisk well. Be sure to add the milk slowly so it doesn’t curdle the eggs. Let stand until still warm, but not hot. Turn the mixer on low and add the milk and egg mixture in a slow steady stream. Let mix, raising the speed to medium, until smooth. Add yeast mixture. Lower the speed and add about 2 – 2½ cups more of the gluten-free flour blend. The dough should be fairly sticky and smooth, but not too stiff. Turn off mixer and let dough stand for a few minutes. Grease a bundt pan. Transfer the dough to the pan and smooth it evenly. Brush the top with the melted butter or oil. Cover with plastic wrap and let rise for 45-60 minutes in a warm place. The dough won’t have doubled, but it will have risen quite a bit. Preheat oven to 400°F. Bake for 40-45 minutes, or until golden and baked through. Let cool in the pan for a few minutes, then turn out onto a rack to finish cooling. Make the glaze by whisking the orange juice and powdered sugar. Pour over the cake and let stand for a few minutes before cutting and serving. The cake is the very best the day it’s made. Wrap the leftovers well to prevent them from drying out. You can also cut into slices and freeze them individually, wrapped tightly in plastic wrap and then in a zipper bag. The cake is not very sweet. If you prefer a sweeter cake, add more sugar or make extra glaze. This is one of my favorite recipes. May want to edit to include adding the bloomed yeast mixture.